Justice League of America #3 is the kind of story Geoff Johns writes best, in my humble opinion. Johns is best known today for his grand space epics yet my favorite Johns' stories were always his smaller, more character-driven works. Our main story here reminds me quite a bit of Johns' JSA and Hawkman, featuring a lot of small scenes which unveil more of our less-developed cast members as the team continues to investigate a secret society of super-villains. My favorite moment, perhaps out of an obvious personal bias, involves Stargirl and some discoveries regarding her family and home-life that definitely set her apart from the character Johns created for Stars and S.T.R.I.P.E. as a fledgling writer. I still want to know where her Cosmic Staff came from since there isn't a Ted Knight on this Earth to have built it. Is there? Maybe? David Finch does his usual excellent job on the pencils, with Richard Friend offering a friendly assist on the inks. Finch's style approaches photo-realism without seeming traced or posed. His inks subtly shade the surroundings in a way that adds to the drama of Johns' script. Consider in the above page how Stargirl is always in the light while Walker's face is always half-shadowed or turned away from the reader, symbolizing both their roles on the new Justice League of America team - The Star and The Shadow. Face and Hand. The back-up story by Matt Kindt is a rousing good read as well. This story focuses upon Martian Manhunter performing a mind-scan on Catwoman to confirm her motivations and trustworthiness before she is allowed to join The Justice League of America. This sequences serves as a far better introduction to Catwoman's character than anything else I've seen in the New 52 thus far. 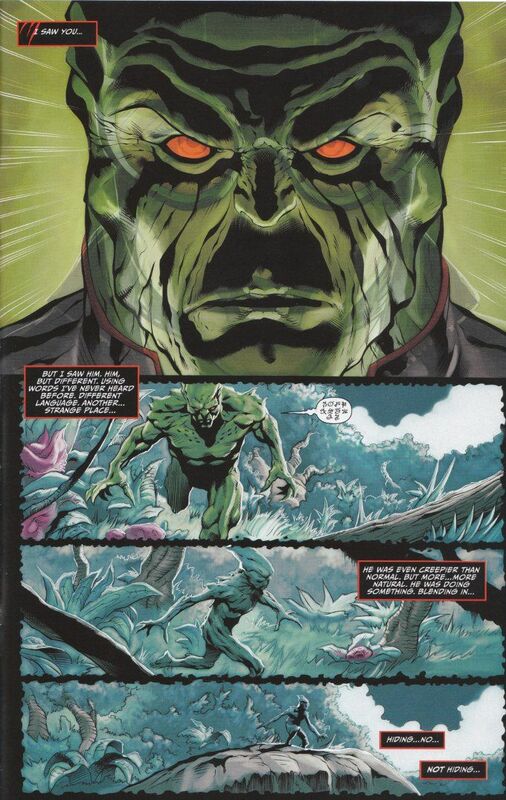 It reminded me somewhat of Jim Butcher's descriptions of a wizard's soul-gaze in The Dresden Files books even before the bit where Selina is somehow able to stare back into J'onn's mind and gets a glimpse of just how alien he truly is. This second story is ably illustrated by Manuel Garcia with inks by David Beaty. The team does a fine job of depicting both the dark alleys and urban sprawl that makes up most of Catwoman's memories as well as the otherworldly forest that make up J'onn's memories of hunting on another world. It is a perfect complement to Matt Kindt's story. Justice League of America is everything you could hope for in a JLA book. If you haven't started reading it already, it's not too late to catch up. I think you'll enjoy it.